Businesses with 10 or fewer employees are less likely to have a budget. Skipping a budget can negatively impact financial stability, a new survey found. A budget becomes especially important as businesses grow. But businesses of all sizes can benefit from them. 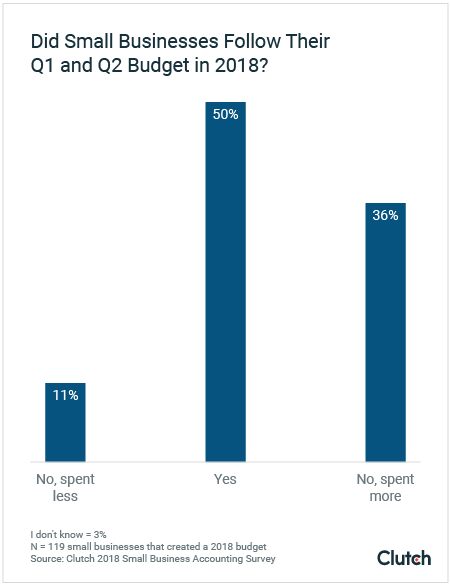 Among small businesses that created a budget for 2018, half (50%) spent what they budgeted for in the first and second quarter of 2018. More than a third (36%), however, say they spent more than they budgeted. Small businesses can successfully stick to a budget by keeping an eye on their original goals and reviewing their finances regularly, according to experts. Small business owner Matt Ross, COO of RIZKNOWS and The Slumber Yard, two e-commerce websites, emphasized the value of conducting monthly budget reviews. Clutch surveyed 302 small business owners and managers to learn more about their accounting practices. Read the full report: https://clutch.co/accounting/resources/why-small-businesses-need-budgets. For questions about the survey, a comment on the findings, or an introduction to the industry experts included in the report, contact Riley Panko at [email protected].